Now that the debacle of the van repair was over the road trip was back on track and I was free to enjoy the remaining few weeks relatively stress free, with the threat of breakdowns reduced and any hostile Austrian mechanics left behind. With Fanny safely parked in Prague, I was finally able to experience the city’s vibrant nightlife, and what better way to do it than partaking in one of the famous bar crawls. Hopping in and out of some of Prague’s coolest bars all the way to Europe’s largest nightclub was an ideal way to see the what was on offer, all whilst indulging in cheap beers and spirits. The free power hour at the first destination threw us in at the drinking deep end with free beers, wines and absinth being swallowed in what we viewed as a challenge to make the most of the booze without paying. The absinth was a demon I was keen to conquer after a rugby social challenge saw me down a wine glass of it which led to me passing out about half an hour later. Before we even left the first bar we were all in very good spirit as we followed our American guide to the next watering hole where we continued our excessive intoxication. The rest of the bars all followed a similar theme of beers, shots and dancing, all whilst getting friendlier with the other participants on the crawl until we arrived at the grand finale- Karlovy Lazne. The five-story club was a multilateral concoction of nationalities and cultures all dabbling in the various themes of each floor. The cheesy crowd pleasers were first to draw me in, with the attraction of singing Lionel Richie accompanied by Swedes, Hungarians and Australians for a resounding cover. It didn’t take long for the guys to split up in search of different musical genres and in hunt of the bar, so once again we all found ourselves separated and on the path to very different nights. The morning recounts of each individual’s tale of the night is always a fun exercise and the stories of Prague are no exception. On departure from the club Bani opted for the tram to carry him back to our apartment, a journey on which he befriended a composer with whom he drunkenly chatted about his incredible pianist talents and the works of various classical musicians. A talk that was interrupted a few stops in by a rambling Jake screaming ‘Barn’ down the tram as they coincidently ended up on the same carriage. What he was doing a few stops away from the club is still unknown but the incredible timing to be on the same tram as Bani is exceptional in itself, and the pair gladly made it back to their beds. Unfortunately for me and Charlie they took the only key with them, which hindered our return. 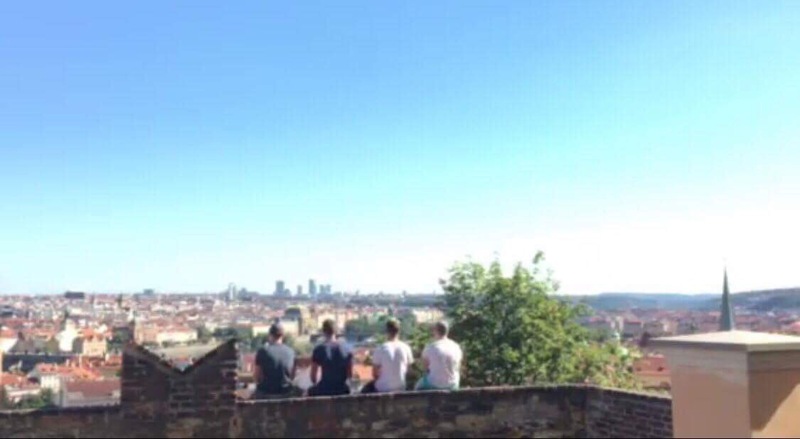 Charlie’s voyage across Prague from the club to the flat consisted of a trek through the town where he took a quick power nap in a park before impressively overcoming his inebriation to navigate his way to a locked door. Shouting up to the window, he tried to get Jake or Bani to aid his entrance and although they heard his drunken pleas, they couldn’t summon the energy or care to get of bed just yet, leaving Charlie on the street for a while longer. My attempt was even less successful. I didn’t make it back to the flat but instead, returned instinctively to the comforts of the van where I made my bed, drew the curtains and passed out under the blankets. It wasn’t until the following midday that I awoke to heavy banging on the door and shouts of ‘Police’ which startled me to get out of bed, only to find it was the other three hoping I slept in the van and not some strange bench in the park. In addition to the standard sore head, the fallout of the night included a fowl stench in the van from the bucket I used to pee in, a severely cracked phone screen, a missing fridge magnet, and worst of all- the loss of both bikes which had been stolen off the rack as I slept. Although that wasn’t as bad as losing a wallet, a fate regrettably suffered by Charlie. 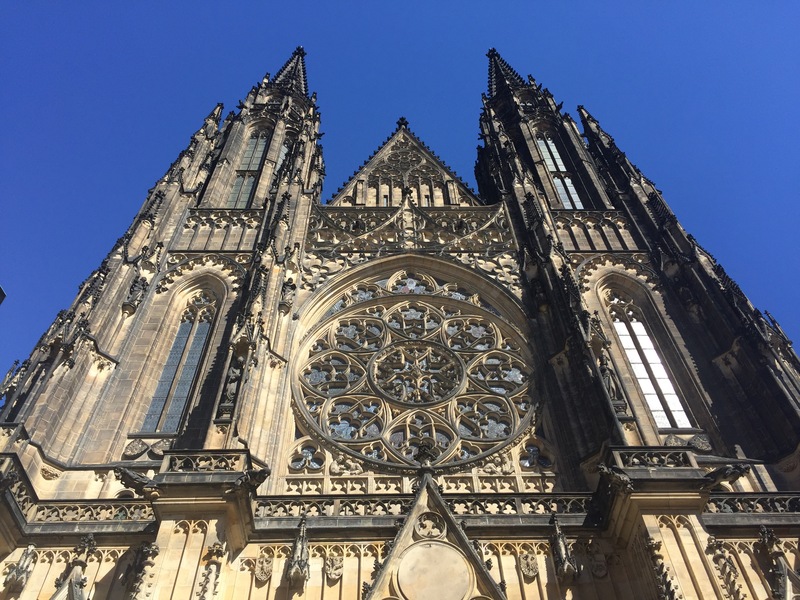 To cheer up from the devastating loss of mine and Bani’s bikes, to which we were very attached to, we headed across the Vltava to explore the sights on the west of the river, such as Prague Castle, St Vitus Cathedral and the John Lennon wall. The long walk up the hill wasn’t ideal considering our fragile mental states after a night fuelled by absinth but the views from the castle at the top were worth it as we looked down on the Czech capital. The 9th century building is the largest ancient castle in the world, covering 70,00 square metres and encasing four churches, one of which being St Vitus cathedral. It has been the home to many princes and kings (such as King Wenceslas- from the Christmas carol) and was even at one point the seat of the Holy Roman Emperor, but now it serves as the home to the president of the Czech Republic. After looking round the old castle we headed back down the river to the John Lennon wall, a fascinating tribute to the legendary Beatle and a symbol of free speech and peaceful rebellion. In my grumpy hungover state I didn’t fully appreciate the colourful wall as I yearned for a drink and a lie down but the landmarks history is intriguing in retrospect. Starting as just a painted pictorial tribute after Lennon’s death, the youths of Prague risked a jail sentence as they painted on their grievances with the regime, inspired by the man loved for his fight for equality and peace. Despite many coats of whitewash from the government the reapplication of the graffiti persisted in the fight against oppression and now stands as a proud tourist attraction. With the wall crossed of the list of must sees in Prague I was finally able to relax by the river, lapping up all the recuperation I could before the long drive to Germany the following day.